Willem III, Prince of Orange-Nassau, was born in Brussels on 19 February 1817. He was King of the Netherlands and Grand Duke of Luxembourg from 1849 until his death. From 1849 to 1866 he was also Duke of Limburg. Willem III unsuccessfully opposed the restrictions on royal authority accepted by his father. In 1839 he married his cousin, Sophie of Württemberg (1818-1877). It was not a happy marriage, as their characters were incompatible. Their three sons, Willem (1840-1879), Maurits (1843-1850) and Alexander (1851-1884), all died before their father. Queen Sophie died in 1877. In 1879 the King remarried, this time to Emma of Waldeck-Pyrmont (1858-1934).The couple had one daughter, Princess Wilhelmina. 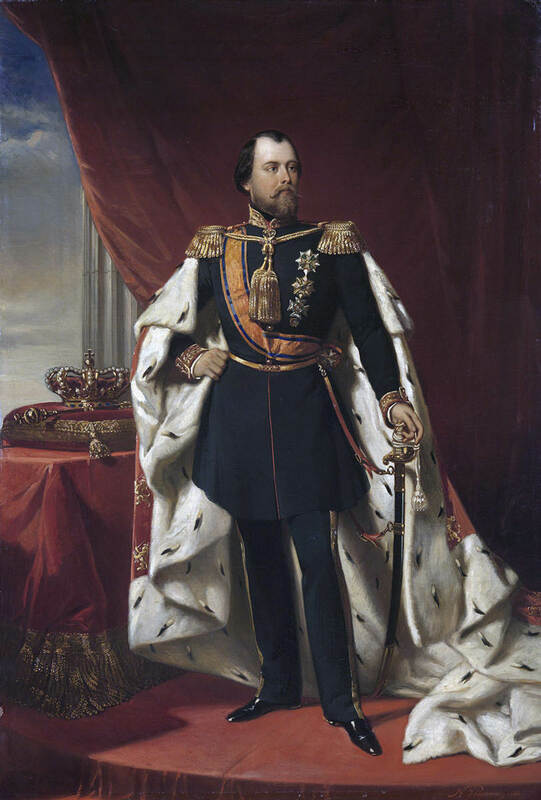 Willem III died on 23 November 1890.